Earth's Best has a whole line of Sesame Street products that are made with organic ingredients. 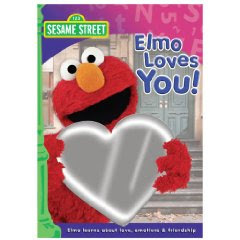 They are celebrating Elmo's birthday this February with a promotion for a free Sesame Street: Elmo Loves You! DVD (plus $1.49 shipping and handling). What a great deal and just in time for Valentine's Day! Offer expires 3/31/09. Check it out at Earth's Best Special Offers, along with their other special offers including a FREE Sesame Street Happy Healthy Monsters Book.